After five years of solo biking in Chicago left her craving more interaction with fellow bikers, Leah Neaderthal realized her problem wasn’t unique. “My friends didn’t ride bikes,” she says, and it took a lot of research to figure out which biking niche fit her style. The bike community is notoriously fragmented, and much of what makes it appealing to so many different people also makes it difficult to organize. “The bike community is unique because there are so many different kinds of riders in it,” says Neaderthal. But Neaderthal found a way to improve accessibility to bike activities while maintaining the diversity of the community. 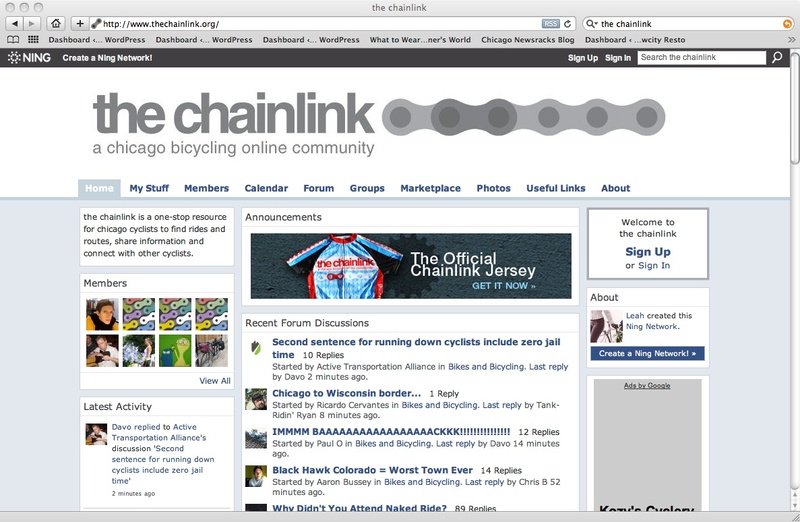 Neaderthal, who works in marketing for the software company Savo, started The Chainlink, an online community for Chicago bikers, and now runs the site with Julie Hochstadter. Neaderthal contacted club leaders, put fliers on people’s bikes and spread the word. She didn’t want to change the way any one organization biked—she just wanted it to be easier for people to find the bike community that fits their needs. “I think it’s not just about riding with other people, it’s about riding with other people who ride the way you do,” says Neaderthal. The jury’s out on whether you’re more likely to find your stolen bike or your missed connection first, but The Bike Theft Task Force might improve your bike’s odds. The vigilante bike rescuers, who organized on The Chainlink, hit up flea markets in search of bikes listed on the Chicago Stolen Bike Registry, an online forum that posts descriptions of stolen bikes. The Chainlink, says Neaderthal, has aided in the recovery of a number of stolen bikes.